Foodoro, a new Y Combinator startup launching today, is an online marketplace for specialty artisanal foods. 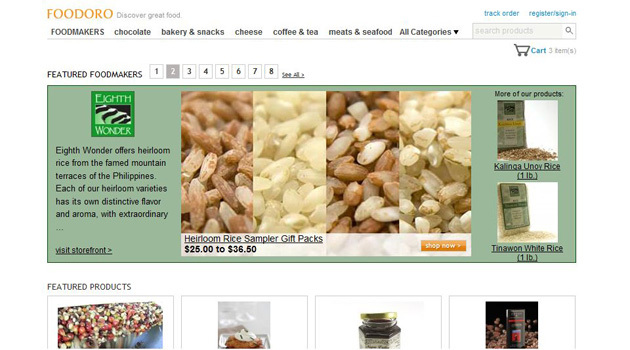 The site allows foodies to ship items like sesame nut spice chocolate and Mountain Jasmine Green Pearl Tea, to themselves or friends and family. The site offers a variety of hard-to-find food items from 54 vendors across the country, ranging from California cheese makers to Nebraskan buffalo farms to rice grown in the Philippines. Foodoro’s concept is fairly similar in concept to a TechStars‘ startup we reported on last year, Foodzie. Like Foodzie, Foodoro aims to be an online hub for artisanal food makers, exposing these vendors to a greater audience of food aficionados than they would get from their own sites or selling solely to specialty food stores. Foodoro takes a 15 percent commission on each transaction whereas Foodzie takes a 20 percent commission on transactions. Both Foodoro and Foodzie leave distribution up to the vendors, allowing the marketplaces to it focus on the transactions, which can be helpful to the vendors who aren’t familiar with e-commerce. However, Foodoro is doing some pretty nifty things to help these small food vendors incorporate e-commerce into their own sites. Foodoro provides the vendors with an e-commerce widget that they can embed on their sites to allow customers to easily buy the product. Foodoro is also trying to engage the food blogging community by implementing an affiliate program (like Amazon’s) that lets food bloggers earn a percentage on traffic they refer to back to Foodoro (the bloggers can also embed a widget of a product they are writing about in their blogs). The site also publishes content from food bloggers, including reviews and product photos, with links to the food bloggers’ sites. Foodoro also offers a variety of shipping options via UPS, FedEx, and USPS (Foodzie only offers FedEx as a shipping option). That being said, shipping on food items can be pricey and sometimes close to if not more than the price of the product itself. For example, overnight shipping for four abalone steaks, (which are priced at $20), is $32.11. The vendor sets the shipping requirements of whether a product should be shipped overnight, two-day etc. Given the current state of the economy, its plausible to think that most consumers would be hesitant to spend money on high-end, pricey food items. Jay Moon, one of the founders of Foodoro, says that while the startup is not immune to the economic downturn, the company hopes to gain strong business in the food gifts market, which has become increasingly popular. Foodoro is hoping to capitalize on what they say is one of the fastest growing gift verticals, with the food gifting market collecting $15 billion in revenue for 2008, according to Foodoro.